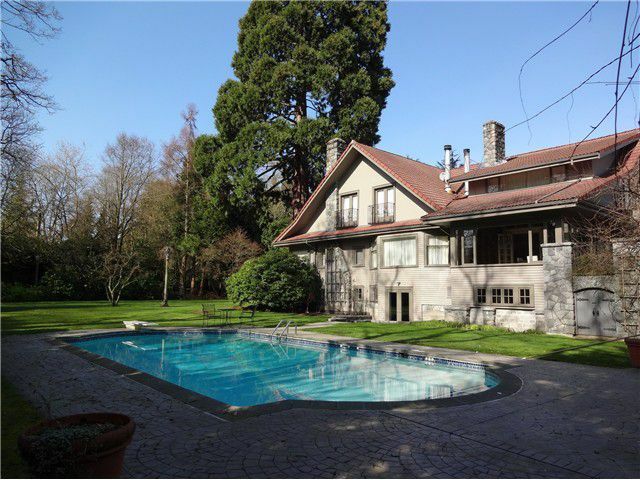 Incredible, exceptional & magnificent property in most prestigious 1st Shaughnessy location! Rare find almost 38000 sf huge flat corner lot with over 8000 sf flr area + 1098 sf coach house. This elegant character home has been updated overthe years. Solidly built w/ architectural details thru-out, high ceilings, entertaining size livg rm, romantic dining rm w/ built-in cabinets overlooking pool & gardens, gourmet kitchen w/ granite counter tops, stunning master bdrm w/ view to picturesque garden, climate controlled large wine cellar, fullly equipped gym, fabulous custom stone deck, Grecian style outdoor pool, park-like garden w/ mature landscaping. Close to York House Private School, St. George's School, UBC, shopping & transit.